Get the benefit of jeweled ears for you or your child, without the risk of infection, allergic reactions or other complications. Skinpeccable Medical Ear Piercing is designed for those who are concerned with the health risks associated with ear piercing – blood borne viruses (such as Hepatitis) and nickel allergy – Skinpeccable considers ear piercing to be a medical procedure. With that in mind, the Blomdahl Medical Ear Piercing System used by Doctor Raphael Darvish has been designed from a medical standpoint, using modern technology and safe materials. 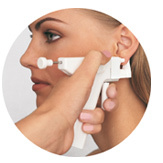 To ensure the safest possible ear piercing, the Blomdahl Medical Ear Piercing System is available through physicians only.